I won’t live long enough to make everything I want to make. I don’t stitch fast enough and I keep getting distracted by other things like eating food, sleeping, and cleaning out the microwave. At the rate that I get things done, I have enough planned projects to keep me busy for the next 50 or 60 years. I might get another 50 or 60 years on this earth. Maybe. If I’m very tough (only the tough can handle getting old), very lucky in traffic, and don’t meet up with any homicidal microbes, I could live that long. Maybe. I might even have enough wits and eyesight left at the bitter end to weave in my last yarn tail and wrap the final wool-y thing around my shoulders before scooting off to a condo in the sky. So if I stop looking at patterns right now, today, I have a razor-thin chance of finishing up everything I want to make. But that won’t happen. I added four new things to my que just this month. I’ll probably add at least four more next month. Why? I can’t stop looking at patterns. I download them and read them like they were stories and if I like the story the pattern tells, I add it to the list of things I want to make. Here are the four I added last month. I like them. I want to make them and I will do my best to get to them. They are all recently published and free and if you look too closely at theses patterns they might end up in your que too. If that happens you can totally blame me. One of the annoying things about believing in free will and individual responsibility is the difficulty of finding somebody to blame your problems on (said PJ O’Rouke) so let me make that part a bit easier on ya! Blame it on me and don’t give it another thought. 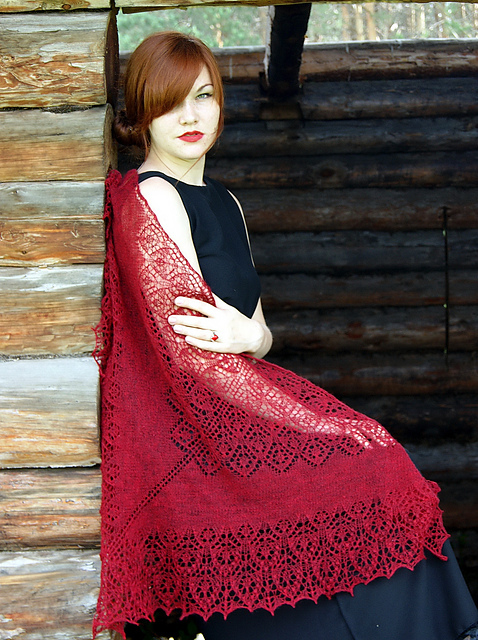 Sofia Shawl by Lyubov Shalnaya. A free pattern with versions in English and Russian. Here is a shawl story that you may already know but you will love to read it again. Things begin in the center, in a small way and then they grow. Like most triangle shawls, its a really two triangles, two halfs that form the whole. The lace story is mostly Russian with an Estonian flare. What I love is the elegance and the dedication to a theme, to one motif. 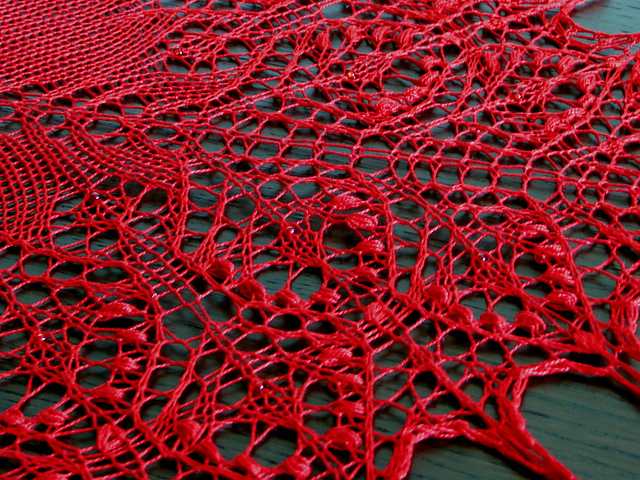 Too many lace pieces are overly ambitious and the results is just muddled. This is a story that takes you gently along, right where you expect to go, and shows you some lovely scenes along the way. There are beads and nupps but those are always optional. You’ll find a small surprise at the end. Its a a bit of a plot twist but not an uncomfortable one. 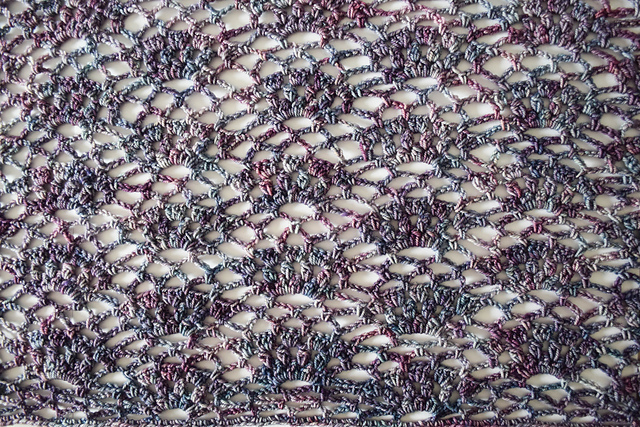 The pattern identifies specific blocking places, stitches that you should fix with a pin during the blocking. I’ve never seen that in a pattern before and I like it. A parting thought: if you decide to make this one, I have a cheater way to make nupps a bit easier. You might find that useful. Tradescantia Zebrina by Natalia Vasilieva. Free sock pattern that will grab hold of your imagination. This little gem of a pattern was part of Sock Madness 9. When you are ready to give your whole attention to this sock story, you can dive right in to a great thriller. The pattern author asks a lot of her readers knitters but she gives a lot too. The pattern is 19 pages long with detailed pattern notes, links for stitch help, color coded diagrams and of course instructions in both graph and written form. No its not for beginners. Its for dedicated switchers. But look at the pay off! I just love the way the first leaf set grows right out of the two color corrugated ribbing. I don’t know if I will ever have time for these, but my feet want them. They want them a lot. I knit the second toe under a tornado watch in the closet with a trembling fraidy cat dog. I love my battery OttLite…. Picnic Basket Shawl by Marie Segares. A free pattern and ongoing crochet-along. Still plenty of time to join in. This shawl was published as a Crochet-A-Long and the final clue just came out three days ago. Its not too late to get started. The “big reveal” is planned for August 31. I went poking around in the pages of people who are working on this baby and lo and behold…. I found OldCrazyHooks. She has this one started and she says the pattern has a little crack in it. I guess I agree. This a a fun summer read crochet. Its light and airy and the story will make you smile. Marie Segares, the designer, sort of has a thing for crochet pineapples and this is a version of the traditional pineapple motif that looks a bit like picnic baskets. To me her shawl is a story where the characters think they are going on a month vacation at the beach to work on their tans and flirt outrageously with the locals but end up solving a murder mystery. Fortune’s Shawlette by Moogly. A free pattern and a one-skein wonder. Moogly cranks out free patterns the way I crank out pots of brewed coffee. I like her stuff. I’ve written about her work before and I’ll probably write about it again. I’ve been following her for years that that’s not likely to change. You know how it is when one of your favorite authors turns out another book pattern right? You have to pick up a copy because you know before you even crack it open that you’re going to like it. 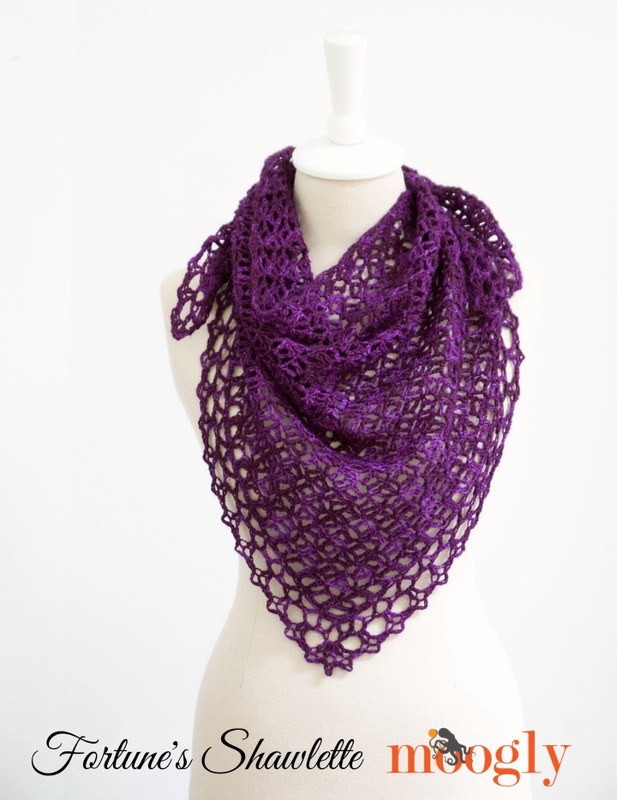 Fortune’s Shawlette is a modified corner stitch pattern. Its four rows on repeat. Its done before you know it. Well, I say that not having made one but the pattern was published just 20 days ago and already over three hundred happy hookers have it in there ravelry project page. It must be lickitty-split quick. Like a bosom-ripper romance novel that you finish in one night! So how many of these patterns did you go grab a copy of? All four? Good. My work here is done and I have to get back to stitching. I have a lot of things to make so I can make these too. Want to read about more stuff I like? You can find it all right here. 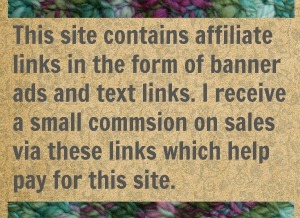 19 Comments on "Weekly Rec – I Can't Resist New Patterns"
I discovered this summer that knitting shawls isn’t my thing, as I have this amazing triangle loom that allows me to weave with my handspun in a bunch of different sizes. HOWEVER, I will thank you for telling me about Frankie Brown patterns! 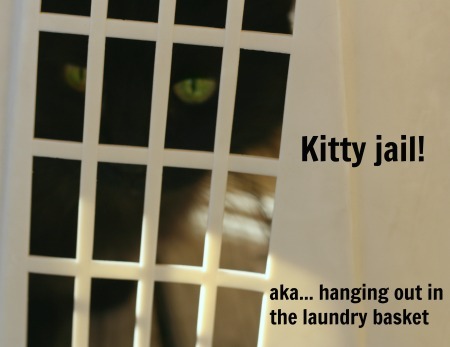 The only problem—I can’t seem to get one a day done, something about silly things like barn chores, feeding the two legends, and oh, yes, answering to the Supurreme Commander? Franki Brown is pretty great. She is a knitting hero. Oh, are we allowed to blame our lack of progress of the four-legged furry ones? Cuz I can get behind that. I knitted a little hap just a couple of weeks ago, so I’m good on the shawl front…but those SOCKS!!! I’ll be looking at that pattern very soon! Thoss socks are pretty awesome. I picked up the knitting patterns, I don’t do a lot of crochet, and I only (kinda) picked up crochet for those amigurumi patterns that I can’t replicate in knitting. That sock pattern is irresistible I think.